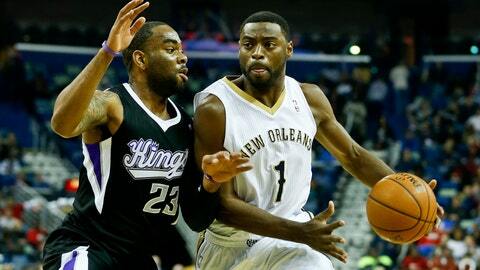 Jan 21, 2014; New Orleans, LA, USA; New Orleans Pelicans point guard Tyreke Evans (1) drives past Sacramento Kings shooting guard Marcus Thornton (23) during the first quarter of a game at New Orleans Arena. NEW ORLEANS (AP) — Rudy Gay tied a career high with 41 points, and the Sacramento Kings cruised to a 114-97 victory over the New Orleans Pelicans on Tuesday night. Isaiah Thomas had 20 points and 11 assists, while DeMarcus Cousins had 18 points, 11 rebounds and four blocks for the Kings, who’ve won five of eight. Gay hit 16 of 25 shots, including 5 of 8 from 3-point range. Tyreke Evans scored 17 for New Orleans, which trimmed a 23-point first-half deficit to six shortly before halftime, only to fall behind by 23 again in the third quarter and remain behind by double digits the rest of the way. Anthony Davis scored 16 points and blocked four shots, and New Orleans rookie center Jeff Withey had a career-high 14 points, but that was not nearly enough to prevent the Pelicans from losing for the ninth time in 10 games. Quincy Acy grabbed 10 rebounds for the Kings, who outrebounded New Orleans 46-35. The Kings were the sharper team from the outset, shooting 70 percent (14 of 20) in the first period, during which they scored 38 points and build an 18-point lead. The Kings’ lead grew to 23 on Gay’s 3 midway through the second quarter, and it might have been worse if not for Withey’s 12 points in the period. New Orleans enjoyed momentum for only the last half of the second period, scoring on 10 of their last 11 possessions. Withey’s dunk sparked a 12-3 spurt, capped by Roberts’ fast-break layup. Next came an 11-2 run during which Evans scored eight, trimming Sacramento’s lead down to six at 62-56 before Derrick Williams’ free throws gave the Kings a 64-56 halftime lead. If the Pelicans thought their second-quarter surge had them in striking distance of a memorable comeback, they were sorely mistaken. Sacramento opened the third quarter with a 17-4 run, which began with two baskets by Cousins’ and included two 3s by Gay, the second making it 83-60. The Kings led by as much as 24 in the second half and were not threatened after that. NOTES: Gay also scored 41 at Miami on Dec. 13, 2009. … The Kings conclude a six-game road trip Wednesday night at Houston. They are 2-3 on the trip so far. … Four players spent at least one season of college under current Kentucky coach John Calipari: Cousins, Davis, Evans and Darius Miller. All are former Kentucky players except Evans, who played at Memphis, Calipari’s previous stop. … Sacramento beat New Orleans for the second time in six meetings.